Are teachers a committed lot? This entry was posted on 20/07/2018, in Conspiracies, Corruption and Cheat, Editorials, Laments, News | Newsmakers and tagged Teachers' Strike. Bookmark the permalink. 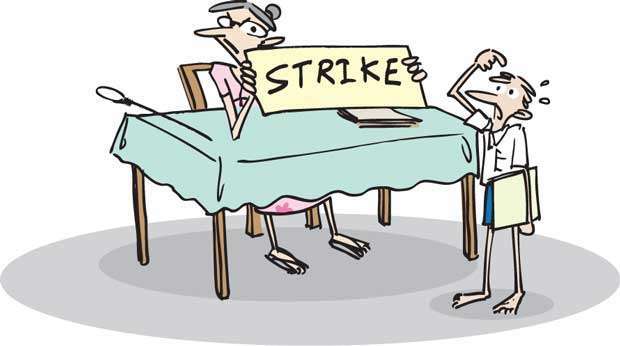 Sri Lanka’s teacher trade unions through their strike actions have time and again negatively impacted the studies of children. Yesterday (Thursday) they were set to launch strike action against the questionable appointments of many teachers to the education sector. The appointment of unqualified individuals to the education sector must be checked and no parent nor Government official would contest such efforts. But what is of great concern is the overall decline in the commitment of teachers towards carrying out their duties in classrooms. It seems that most teachers are more inclined towards winning their rights rather than being positively engaged in this noble profession. There was a golden era in teaching when teachers went out of their way to educate their chargers. We have heard of teachers in the past conducting extra classes, often after the schools closed, with no benefit to them, but largely to ensure a bright future for their students. We get to hear of how some teachers are lethargic in popular schools in Colombo that children are left helpless. This leads to syllabuses not being covered in keeping with the work planned for a term. These under performing teachers must take the responsibility for the blooming of the tuition industry; which makes children lose the confidence they have in their school teachers. A close look at how these teachers perform reveals that they have mastered the respective subjects they teach, but know little or nothing about how to deal with children. As a result most teachers are arrogant, impatient and prefer teaching the bright ones. You don’t need skills to teach bright students. What these teachers need to learn is how to make the not so bright ones interested in a subject. There are several courses conducted in Private Education Institutes which offer courses in ‘coaching’. The issue however is that these ‘coaching’ sessions are expensive and don’t allow the teachers to afford them, given the paltry salaries they earn. Another reason that contributes to teachers being grumpy is the meagre salaries they earn. It’s a matter of concern that even a well-qualified school principal earns just a little more than a graduate teacher! But one must remember that teachers are in this profession by choice. No one forced them to enter the teaching trade. One of the most required qualifications a teacher must possess is that he or she must love being in the company of children and working with them. Most present-day teachers lack this quality. It seems that some of the underperforming teachers are in this profession because they couldn’t find employment elsewhere. Parents also have constantly complained about the monies that are collected for development work at these schools. There have been occasions when these monies have been mishandled and there being a lack of transparency with regard to maintenance of accounts. Just the other day the Daily Mirror reported how a leading school in Madampe came under the spotlight when Government money allocated to build new washrooms was misappropriated. Parents and their children on such occasions have chosen to stay tight-lipped in fear of having to face repercussions if they complain to the authorities. Another issue that parents face is the constant demand for money by children who come with pleas after they were asked to bring money for a school project. There have also been occasions where parents have had to find advertisements for souvenirs and sell bundles of tickets books, just to avoid their kids being embarrassed in front of demanding teachers. The school system has grown today and is highly politicized with as many as 17 teachers’ unions operating in the country. Most Governments in the past as a result have been willing to lend an ear to the protests of teachers. We are living during times when teachers prefer to channel their energies for trade union action rather than promote a caring and interesting atmosphere to learn at schools.